Episode 37: "Family Appreciation Day"
Intro: The Apple family wakes at night to the howling of timberwolves and the banging of pots and pans as Granny Smith celebrates. Act 1: The Apples prepare for their annual zap apple harvest, which involves a series of magical events. Diamond Tiara's father Filthy Rich visits to secure the firstfruits as usual, and Diamond Tiara mocks Apple Bloom for Granny's peculiar behavior. 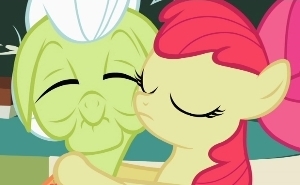 Apple Bloom becomes embarrassed of Granny, just as she's assigned to bring a relative to class for Family Appreciation Day. Act 2: The harvest leaves Apple Bloom with no one to bring to class but Granny, so the Crusaders try various schemes to keep AB or Granny from school. As harvest approaches, they send Granny out of town but she shows up in class the next day anyway. 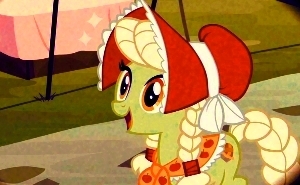 Act 3: Granny tells the story of how her family founded Ponyville, with their zap apples being the source of the Rich family's fortune. The class is enthralled at her tale, and Apple Bloom is once again proud of Granny. The other students then join in the making, selling, and consuming of zap apple jam. Character: Apple Bloom, the other Crusaders, and the bullies are in character here, with one exception. We know AB doesn't take bullying well, but even as desperate as her situation is, I'd expect her to show a little more hesitation about dishonesty given her recent bout with cutie pox. She's usually very conscientious. Nevertheless, I could also see her going through with it if egged on by her friends or prodded by the bullies—speaking of which, we get a hint of their softer side here. Diamond Tiara seems to love her father, and he doesn't seem like a bad guy at all, particularly in the end when he has her "sing to the water" along with the others. Silver Spoon is the first to applaud after Granny's presentation, and alert viewers may recall her making one ameliorating comment back in Call of the Cutie only to be slapped down by Diamond Tiara. Seizing on these two items of silver lining, fanfic writers tend to portray Silver Spoon in a sympathetic light and a few have even had her befriend the CMC. Back to Apple Bloom, it was a good move on the writer's part to have her on enthusiastic good terms with Granny at the beginning and only to "realize" how weird she is when the bullies point it out. This is how peer pressure works, not so much by coercions and dares as by planting ideas that twist one's values and priorities. As I mention in the review of The Cutie Pox, Granny got an upgrade this season. For the first year she was incomprehensible and could barely move, a character impossible to make interesting. She's now much more agile and apparently clear-headed though forgetful and quirky in her words and actions. The in-universe explanation may lie in Discord's manipulation of her in The Return of Harmony Part 2, where we see her dancing. If his negative actions were reversed but not their positive side-effects, he may have brought healing to her joints or reversed the effects of a stroke as a side-effect of his pranks. Anything I could say about the appeal of the new Granny is right here in this episode. I haven't said much about Cheerilee up to this point. She's in the show because Hasbro wanted to continue the name and design from the G3 line of My Little Pony, and the writers put her to work as the Crusaders' teacher. She's definitely a minor character, but she's more than just a stock "nice teacher" and is fleshed out almost entirely in subtleties. This episode's tidbits are the apparently cheerfully oblivious (but probably cheerfully deliberate) way she addresses "Mr. Filthy" and the fact that Diamond Tiara looks mean on Cheerilee's hoof-drawn checklist. She knows what's up with this family. Lesson: No letter to the princess? For shame. Just about every other episode so far (aside from the two-parters) has at least mentioned a letter or stated the moral in Celestia's presence. As noted above, it looks like Apple Bloom didn't really learn her lesson about honesty back in The Cutie Pox, and also doesn't face any consequences for lying this time around. That's believable, especially with the CMC, but it hurts the moral impact of this episode and makes us wonder whether the writer was mindful of the other episode. But the primary lesson is handled effectively: Children and, perhaps more often, teens and young adults, are often uncomfortable or embarrassed around older people and don't realize the wisdom and knowledge they have to offer. I've never seen this lesson addressed on other children's shows, so it's great to see it here. 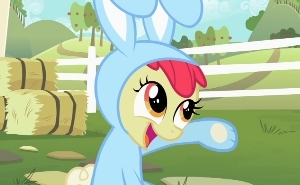 Logic: Technically, Apple Bloom is acting more like a thesaurus than a dictionary. We get some good world-building history here that justifies the Apple family's prominence to the town. Unfortunately, a line from Winter Wrap Up throws a wrench into this. (The exact words there are "Ponyville was started by Earth ponies, so for hundreds of years they've never used magic to clean up winter," which implies the town has been around that long.) A number of explanations and alternate interpretations have been offered, the simplest is just that Twilight didn't know the timeline of Ponyville's history yet. Connections: The Ponyville backstory is a good lead-in to The Super Speedy Cider Squeezy 6000 episode later this season. Resonance: The appeal of usual Crusader antics are a matter of taste, but I definitely found everything involving the bunny suits to be funny and overwhelmingly cute. Sweetie Belle's face as she wakes up in classes is priceless. Silver Spoon's applause and Apple Bloom finally standing up for Granny were seriously happy moments. The timberwolves are quite scary, even more so here than in their more lengthy appearance in Spike at Your Service. Other Impressions and Final Assessment: This episode originally aired twelfth in the season, since Hearth's Warming Eve was moved up in the schedule to coincide with Christmas week. I follow the order of episodes on the Season 2 DVDs, so this is counted as S2E11. The zap apple process is fascinating in itself and acts as a sort of B story to the main plot. It's a nice reminder of the magical nature of Equestria even among earth ponies. It's also potentially creepy for its clouds, lightning, crows, and timberwolves (and bees, of which I am not a fan). 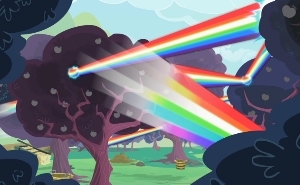 Granny attributes the whole process to the proximity of the Everfree Forest. The author had the difficult challenge of writing a four-and-a-half minute, mostly monochrome sequence of flashbacks with no dialogue other than Granny's narration, and making it as interesting for us as it is to the students. She pulls it off well. I do have one complaint about the applause. In the first season, ponies consistently stomped the ground to show appreciation; here they clap their front hooves together in a more human-like gesture. I'd prefer the humanized poses and behaviors be kept to a minimum. Overall, a good Crusaders episode, hurt by the overly casual handing of Apple Bloom's dishonesty so close on the heels of The Cutie Pox.